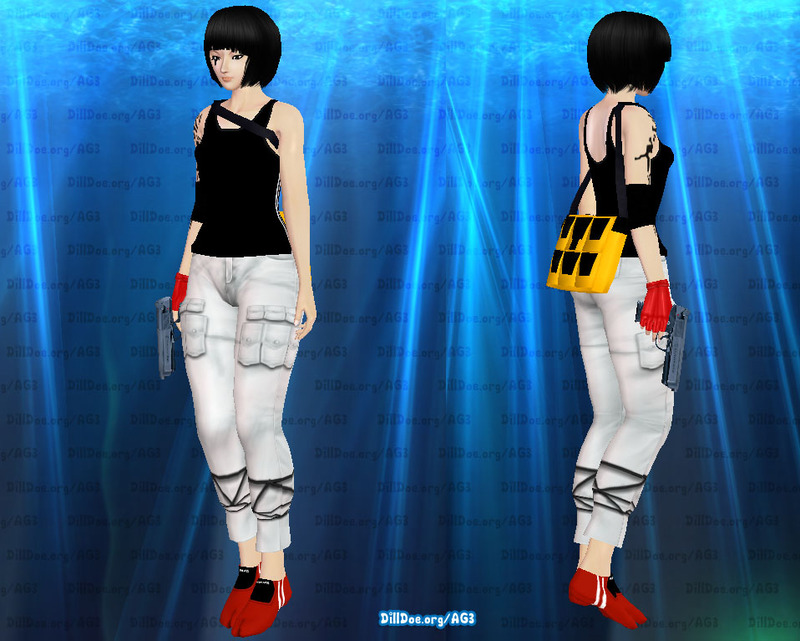 Mirror’s Edge Faith Character & outfit! As always I tried to get it as to look as much as the original as I can. Faith has a VERY asian face, bigger cheek bone as well as a semi square jaw and very ethnic eyes. I edit the face mesh to look almost like her, BUT the game does not like it if you edit the eyelash, blush and/or other items on the face. The face had a huge slit/gap right down her face, as well as other weird effects. I had to revert it back to AG3 Make version inorder for it to work in the game. The hair really gave the the most problem. I kept getting edge lines in the texture, where you can see a semi-transparent white outline where the hair ends. I finally get rid of (99%) it. I also had to edit it to give that round, bob look. The default had the back and front tapering in near the ear, so I had to round that out. The hair will clip with her face during some scenes due to the it being so close to her face. Her tattoo should be a 90% match. Best I can find on the google. I also change her skin tone to match the original one. Her outfit is very simple, yet it took me four tries to get it right. 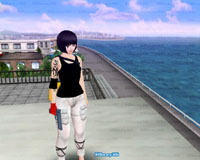 The tank top was originally the swimsuit, which I changed to my custom full body top and edit to look like the swimsuit. I did this because I wanted to add an underwear to the outfit and also I wanted the tank top to be pulled up, over the breast, instead of pulled down around the waist. For some unknown reason, during the final test it would crash when I tried to remove it during H-scene. After almost a day of trying to fix it, I scraped it and redid it. I still have no idea what went wrong. I wasn’t gonna do the bag or gun, but I was trying to get it to match the original so I gave in and made them. The bag is interactive, so you can take it off or on during H-scenes. The gun however is not interactive and disappear during H-scenes. It’s just basically a modified version of the Tomb Raider Gun. Pants & shoes are mainly texture with minor mesh editing. Enjoy and have a Merry Christmas and Happy Holiday!